Published on November 16, 2008	in 2008. Dalgħodu, il-Ħadd 16 ta’ Novembru 2008, Dr Joseph Muscat, Kap tal-Partit Laburista, għamel żjara ta’ korestija lill-Isqof Mario Grech, fil-Kurja, ir-Rabat Għawdex. L-Isqof Grech għamel dan id-diskors. Napprezza ħafna din iż-żjara tiegħek fil-bidu tal-missjoni tiegħek bħala Kap tal-Partit Laburista. Fil-persuna rispettabli tiegħek, nilmaħ mhux biss il-mexxej politiku ta’ parti sostanzjali tal-Poplu Malti u Għawdxi, imma wkoll il-Kap tal-Oppożizzjoni fil-Parlament, l-ogħla istituzzjoni ta’ pajjiżna – dik l-istituzzjoni fejn jinħmew u jiġu definiti l-liġijiet ċivili; u għaldaqstant membru distint ta’ dik l-istituzzjoni li għandha qawwa li tagħti direzzjoni lil ġensna. Din iż-żjara tiegħek żgur li tqanqal riflessjoni dwar ir-relazzjonijiet bejn il-Knisja u l-Istat. Dwar ir-rapport bejn l-isfera politika u dik reliġjuża, l-Imgħallem tagħna, il-Mulej Ġesù tana prinċipju importanti li jgħinna nsibu tweġiba: “Agħtu lil Ċesari dak li huwa ta’ Ċesari, u lil Alla dak li huwa ta’ Alla” (Mk 12,17). Huwa importanti ħafna li tkun ċara din id-distinzjoni bejn il-politika u r-reliġjon biex jirnexxilna nħarsu u nippromovu kemm il-libertà reliġjuża taċ-ċittadini – individwalment u kollettivament – u r-responsabilità tal-Istat lejhom; kif ukoll biex ikun hemm għarfien ċar tar-rwol insostitwibbli tar-reliġjon fil-formazzjoni tal-kuxjenzi u s-sehem li r-reliġjon tista’ tagħti flimkien ma’ aġenti soċjali oħra biex fis-soċjetà jinħoloq consensus etico di fondo. Published on January 24, 2008	in 2008. Il-Kelma t’Alla llum turina li Ġesù kien jattira n-nies; kien infuwenti fuq dawk ta’ madwaru. Għalkemm kien ikollu l-folla tisimgħu, Ġesù ma kienx jittraskura lill-individwu. Kellu attenzjoni personali għal kulħadd. Da parti tagħha, in-nies kienet tfittxu biex tisma’ l-kelma tiegħu; għan-nies, kliem Ġesù kien jagħmel sens u jagħti sens. Kliemu kien jirrifletti l-ħlewwa ta’ l-imħabba t’Alla lejn il-bniedem. Published on January 15, 2008	in 2008. 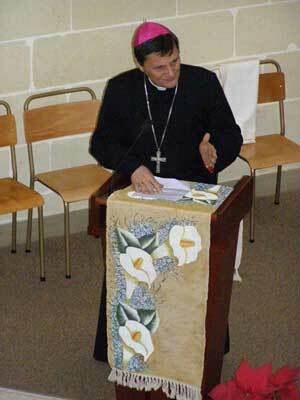 Sono molto contento che il Suo primo contatto con la nostra Diocesi è stato con il Presbiterio Diocesano, nonché con il nostro Seminario, “casa madre” di tutti i nostri sacerdoti presenti e futuri. Per me, l’incontro con il presbiterio è un momento molto importante, perché come vescovo, il mio primo impegno è la comunione del mio presbiterio – vescovo e preti sono una cosa sola e il ministero presbiterale è un ministero di comunione o altrimenti semplicemente non è; è pure importante, perché insieme, vescovo e presbiteri, “siamo sacramento di Cristo Pastore”. Se fossimo solo dei pastori ognuno per conto proprio, possiamo anche essere in cento ottanta; ma siamo sacramento di Cristo pastore. Non ci sono cento ottanta pastori, ma ce ne uno solo, che è Gesù Cristo. Allora evidentemente noi possiamo rappresentare Gesù Pastore solo se noi siamo una cosa sola nell’amore, nella collaborazione, nella corresponsabilità. Eccellenza, non ho nessun dubbio che Lei è consapevole e convinto di quello che il Suo delicato ministero comporta; anzi, posso attestare che Lei incarna tutti questi valori. Ma l’ho sottolineato solamente per esprimere il perché sono molto contento di accoglierLa a nome di tutta la nostra Chiesa, particolarmente a nome dei miei fratelli nel sacerdozio. Auspico che la Sua presenza tra di noi ci aiuti ad approfondire la nostra intimità con il Signore, la comunione presbiterale, e la nostra vocazione come “sacramento di Cristo Pastore”. Grazie. The Word of God which Mother Church provides us with today, states: “The Lord has spoken who formed me as his servant from the womb that Jacob may be brought back to him and Israel gathered to him” [Is 49,5] (from the First Reading of today, 2nd Sunday in Ordinary Time). The people of God gathered in this Cathedral to give you a deserved warm welcome as our new Apostolic Nuncio, can definitely greet you with the same words: the Lord has spoken who formed you as his servant from the womb that Jacob may be brought back to him and Israel gathered to him. In other words, the Lord has spoken through His Holiness the Pope, the Vicar of Christ on earth, and has sent you amongst us so that the Gozitans may be brought back and gathered to him. On September 29th 2007, I was fortunate to take part in your Episcopal consecration, presided by His Holiness Pope Benedict XVI at St. Peter’s. On that occasion the Pope remarked that in the ancient Church, bishops were described as “angels” of their Church, whereby expressing a close connection between the Bishop’s ministry and theAngel’s mission. The Pope reminded you,Your Excellency [or should I say us! ], that as God’s messengers, Angels bring God to men, they open heaven and thus open earth. Precisely because they are with God, they can also be very close to man and so they speak to man of what constitutes his true being. Unfortunately modern trends surfacing in our society show that we need an angel [ a Nuncio] to announce the truth and help us to find our true nature and to discern and accept God’s plan for us. This is why we receive you with wide open arms: we firmly believe that you are an “angel” with a mission for our Church and for our society. The Apostolic Nuncio is an angel with a difference: as the representative of the Pope, you secure our filial bond with the Holy Father, a beacon of truth, guarantee of authentic Catholic faith and bulwark of human dignity. For this pastoral year we are being accompanied by the icon of the Annunciation to Mary of the Incarnation of God. As we meditate this icon, we encounter the Archangel Gabriel who, in Pope Benedict’s words: “knocks at Mary’s door and through him God himself asks Mary for her “yes” to his project. Even today, God knocks again and again at the door of our heart. In the Book of Revelation, God says to the “angel” of the Church of Loadicea: “Behold, I stand at the door and knock: if any one hears my voice and opens the door, I will come in to him and eat with him and be with him” (3,20). 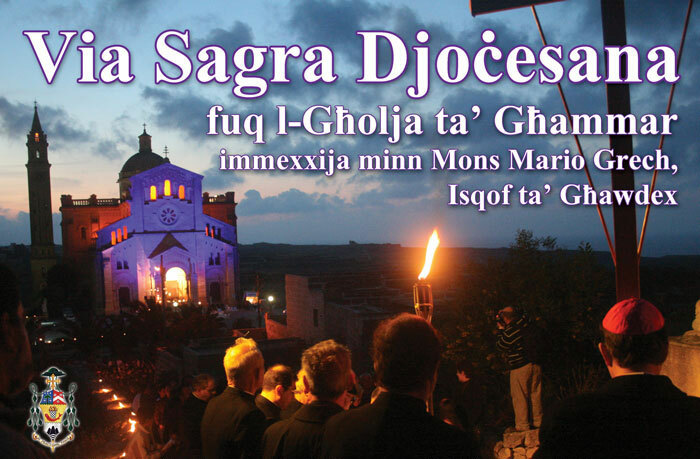 Your Excellency, Christ’s Church in Gozo, today, is confident that during your stay amongst us you will keep echoing these words to us, so that we “may be brought back and gathered to Him”.